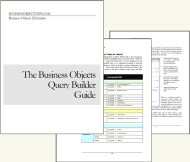 Business Objects Query Builder is a free application provided with Business Objects Enterprise XI (BOXI). It is uses the BOE SDK to provide a simple web user interface for submitting queries against the CMS InfoStore and returning their results. Query performance is improved by using indexed properties in your selection criteria (WHERE clause); however, the order of these can additionally optimize your query’s performance. All selection criteria with indexed properties should be placed first in the WHERE clause. The BusinessObjects Enterprise CMS InfoStore, and therefore Query Builder, processes queries from top to bottom and left to right. Therefore the selection criteria should also be ordered from the most restrictive to the least restrictive. For example, SI_NAME = ‘My Report’ should be place before SI_KIND = ‘WebI’ in the query. It may not be the prettiest query but it will be the fastest. « Business Objects Enterprise: Java or .NET?